Egypt’s Foreign Minister Sameh Shoukry has telephoned Ethiopian counterpart Workneh Gebeyehu to express Cairo's concerns over reports that Addis Ababa rejects Egypt's proposal to involve the World Bank in the stalled technical negotiations over the Grand Ethiopian Renaissance Dam (GERD). Speaking to the Egyptian ONTV talk-show Everyday on Sunday evening, Egyptian foreign ministry spokesperson Ahmed Abu Zeid said Shoukry called Gebeyehu to check the veracity of a report by the official Ethiopian news agency in which Ethiopian Prime Minister Hailemariam Desalegn was quoted as saying the World Bank should not play the role of arbiter in GERD negotiations. 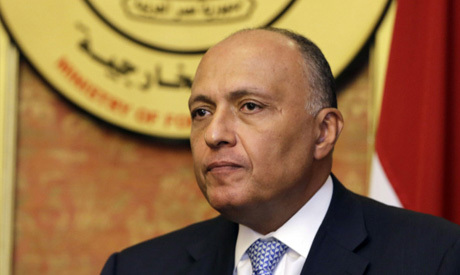 Shoukry also enquired about the timing of Desalegn's alleged statements ahead of agreed upon tripartite talks between between Egypt, Sudan and Ethiopia. The Ethiopian FM told Shoukry that Desalegn's statements “were taken out of context”, Abu Zeid said. On Friday, a day after his return from an official visit to Egypt where he held talks with Egypt's President Abdel-Fattah El-Sisi on the dam dispute, Desalegn was quoted by the Ethiopian news agency as saying that Ethiopia rejects Egypt’s proposal to allow the World Bank to take part in the technical talks over the impact of the GERD on the Nile water share of downstream countries. "Seeking professional support is one thing. Transferring [arbitration] to an institution is another thing. So we told them that this is not acceptable to our side," Desalegn said according to the agency. “It is possible to reach agreement through cooperation and with the spirit of trust," the Ethiopian PM added. Ethiopia's PM Desalegn had told Egypt's El-Sisi during their meeting in Cairo on Thursday that Addis Ababa understands "the necessity of overcoming any current obstacles in ongoing negotiations over the Grand Ethiopian Renaissance Dam." President El-Sisi explained to the Ethiopian PM that Egypt's recent proposal to include the World Bank as a neutral mediator in GERD negotiations was aimed at overcoming the delays in technical negotiations and to reassure all involved countries. The Ethiopian PM said the Egyptian proposal "would be discussed on the level of the tripartite committee during their upcoming meeting." "We stress the necessity of further studying the Egyptian proposal and carrying on cooperation in good faith and trust among our countries. I am confident that we will overcome these problems soon," Desalegn added in Cairo. In December, Egypt proposed that the World Bank be allowed to help settle the dispute between the two countries over the hydroelectric dam that Addis Ababa is building and which Egypt fears will affect its share of Nile water. For the past several months, talks between Egypt, Ethiopia and Sudan over the dam and technical studies on its environmental impact have been deadlocked. Abu Zeid told Everyday that Egypt chose the World Bank to act as arbiter because of its experience in such matters and because it is neutral. “The technical talks [over the dam] cannot be subject to political interpretations. Those who reject the Egyptian proposal should present logical reasons, because the situation does not need any more procrastination,” Abu Zeid said. "Egypt will wait till it receives a clear official response from Ethiopia and Sudan to its proposal at the trilateral meeting then decide on the course of action we will take," the spokesperson said.